Combat Raider, a military training exercise involving various kinds of aircraft, will begin on May 14th in parts of the Powder River Training Complex and in Temporary Rushmore Air Traffic Control Assigned Airspace. The exercise will end on May 16th. Combat Raider is designed to provide realistic scenario-based military training through a full spectrum of modern threats to replicate todays combat operations. From May 14th through May 16th, people living under the Powder River military operations areas can expect to see and hear multiple types of aircraft utilizing these areas simultaneously. There will be potential for loud noises and sonic booms. All bomber supersonic activity will take place above 20,000 feet and all transient fighter supersonic activity will take place above 10,000 feet. People living under the Powder River Two, Three and Gap B training areas should expect to be affected, however, sonic boom activity is possible throughout the entire Powder River Training Complex. Non-military aircraft should thoroughly review FAA NOTAMs and review flight plans to avoid these areas and altitudes where military aircraft will be participating. Please call 1-800-WXBRIEF or visit https://sua.faa.gov/ and https://www.1800wxbrief.com/ for more information. NOTAMs will be issued 72 hours prior to start and will serve as final official notice for the exercise. The 35th Annual Montana Aviation Conference, hosted by the Butte Conference Committee, was a success. Hundreds of aviation enthusiasts gathered at the Fairmont Hot Springs Resort February 28—March 2, 2019. Conference attendees had the privilege of listening to many interesting, unique and educational speakers, as well as attending business meetings, an Inspection Authorization (IA) renewal seminar, a student aviation career presentation, an aircraft static display, scholarship award presentations, social gatherings and exploring exhibitor displays. 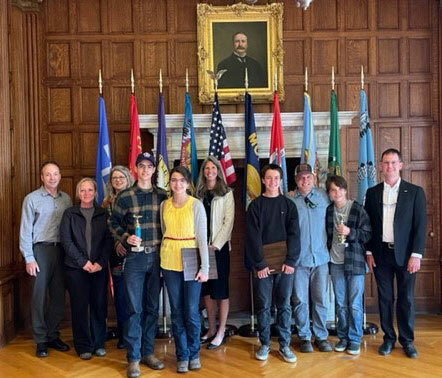 The conference hosted keynote speakers Jeff Boerboon, builder of the Yak-110 aircraft, John Tubbs, Director of the Montana Department of Natural Resources and Conservation (DNRC) and aviation enthusiast, and Sarah Rhoads, Director of Amazon Air.